Since we were the first appointment of the morning we also had a few minutes to tell Howard and Linda how much we had enjoyed the rally. I had written them an email “comment card” and they took it in the spirit it was intended and thanked us for it. Lee spent many years traveling across the country doing large-scale live business events (think huge annual corporate meetings) plus he spent several years doing lighting and stage crew for traveling tours, including Cher and the Eagles. My hubby knows live production. (And a good show is scalable, no matter how small. All business is show business. – Lee) I have trained folks on new software systems all over the country as well…and we couldn’t help but watch the seminar from that perspective. Howard and Linda run a very professional seminar while maintaining a warm and friendly environment. Not the easiest thing to do. The content of the slides was terrific, the pacing was good, the tone and level of detail were perfect for beginners like us. Also many people put the logistics of an event on “auto-pilot” which can lead to problems, but Linda was actively keeping an eye on the food, bathroom cleanliness, temperature of the room etc. If you do those things well they largely go unnoticed, but if they aren’t done well it can make a great seminar very unpleasant…(think about the last time you had to learn something and the room was too hot or cold). Anyway, we were glad to be able to tell them how impressed we were by the quality of the seminar and then, reluctantly, we headed out driving back home. By the way, I really liked the campground. River Plantation is very close to an outlet mall and all the Pigeon Forge attractions but it is also tucked away so if you stay in the campground it feels like you are in the wilderness. I wouldn’t stay in the interior sites, they’re pretty packed together, but the river sites were fantastic and my site #401 backed up to a small waterfall that was lovely. If you’re interested, you can see the end of the post for a full review. It started with the GPS being unclear as to which way to turn out of River Plantation. Because most campgrounds are on private roads the GPS gets confused so we often turn the wrong way out initially…it happens all the time. As we were driving to the highway we saw a couple from the Rally stopped on the side of the road. They are easy to spot because they pull a fifth wheel with a semi truck cab and it was pulled over with the engine off, and the hood up. (Never a good sign! – Lee) Luckily Lee was able to pull us over and walk back to see if he could help. Theresa and Rick were this very nice couple we spent some time with during the open house because Teresa had a custom-built sewing machine cabinet that was pretty cool and I was fascinated by her little sewing area in the RV. Anyway, Rick thanked us for stopping and said he was fine. He had bought a new heater hose at Napa and he said “This is why you always buy from Napa because they have sent someone with a replacement part and he is on his way.” VERY good to know and I have added it to our lessons learned. So back on the road we went. I was feeling a bit sad…having to go back to the real world and was distracted. My job is the navigator and let’s just say I did not navigate well. I knew we had plenty of time before our first gas stop because Lee had filled up the truck prior to hitching up, so I blew off familiarizing myself with the route. So we are driving along and noticing that the Diesel Exhaust Fluid light was on, and wouldn’t go off. In a diesel (and this is all new to us) the EPA requires diesel exhaust fluid…I think it makes the emissions cleaner. Anyway we had gotten a warning message on the way down to the rally and stopped and bought a gallon of fluid. Right before we left this morning, Lee put in a gallon but as we were driving we noticed the message did not change (it states you have X amount of miles before the engine will limit your speed to 50 mph, and then eventually go into idle-only mode.) Ok, so now something that was a minor thing was turning into a big deal. On the fly I am checking the diesel supplement manual and eventually we had to call the dealer we bought it from to ask why the information screen wasn’t recognizing that we had added the fluid. The whole time Lee is driving btw and the miles are counting down. According to the dealer, it should have reset automatically when we put more fluid in but since we only added one gallon (our tank takes five gallons) it didn’t work. They also said that even after you fill it up, you should turn on the vehicle…let it run for 2 minutes…then turn off and do again until it resets. Of course according to Murphy’s law as soon as we got this information we passed the last true truck stop for 50 miles and the mileage indicator is down to 99 miles left. By the way if it totally runs out and you drive too far on none the truck will actually go into idle only mode…so this is nothing to screw around with. Ok, now we knew what do…but we needed more of this fluid, so I pull up all those maps on my IPAD and it’s too far for my comfort level to a true truck stop. I use All Stays generally and a great app called My Pilot but there was only one “Road Runner” travel station 26 miles away. Now Lee is irritated, because he’s stressed from driving, worrying about the mileage countdown, and I am not navigating. In my defense there was a lot going on BUT if I had familiarized myself with the route in advance it would not have been such an issue. We pulled off at the travel station, which claimed to be a truck stop, and there was a sign (which we didn’t see until we were leaving) that said “Absolutely no trucks or trailers)…did you know these are not truck stops but designed for cars??? …I didn’t…It was just a regular gas station. We needed to get that diesel fluid so Lee took a chance and pulled in but then got “stuck” and couldn’t get out because of where cars were parked. He hates that…I mean hates it with a passion and I have navigated us right into that situation. (Let me just say here that there is a special place in hell reserved for people who park in stupid places. There is very little room for error in the geometry of moving something that’s 56 feet long.-Lee) I jumped out of the truck and went and bought 5 gallons of the exhaust fluid while Lee put the flashers on and waited. Once we had the fluid…he backed up (with my spotter assistance) and finally wiggled our way out and back onto the highway. It was not easy, it was not fun, and it was very avoidable…as we stopped at the next rest area, filled the fluid tank completely…turned the truck on and off and the warning light reset. All of this happened before noon. I would love to type here “and the rest of the day went beautifully”, but we were both irritated with each other for another five hours; just got on each others nerves, until we finally took a break and pulled over and talked about it. I want to thank my new friend Cori because when I texted her around 4pm and told her Lee was seriously getting on my nerves her response was “Take a fake nap” I laughed so hard I finally was able to let some of the tension go and talk about it. 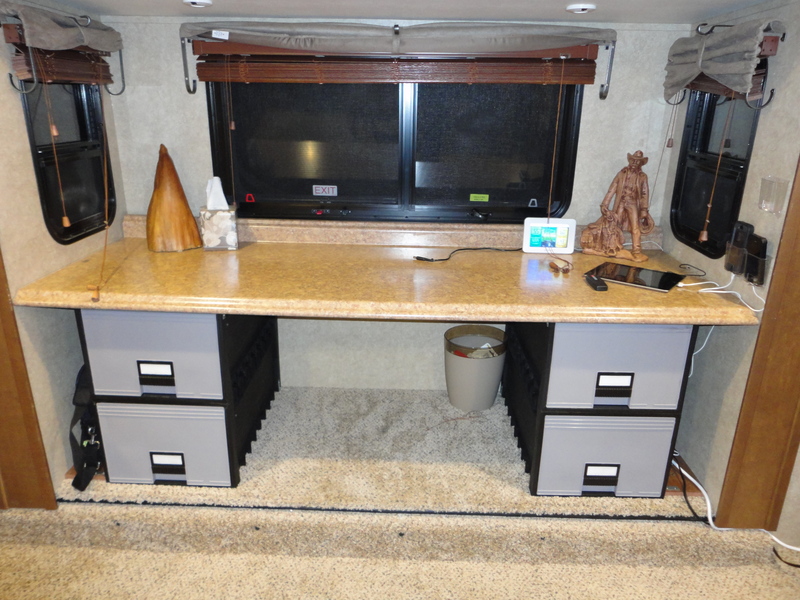 Finally, my friend Cheryl from the RV-Dreams forum wanted to know how Lee built our custom desk. We have a Front Living Room model of an Open Range (386-FLR) and we custom ordered it without one of the couches so that he could build a desk. I was going to wait until it was complete done to post, but Cheryl is looking at building one now and asked for the info…so here it is Cheryl written by Lee because I honestly have no clue how he did it…I just know I LOVE it!!! So, this is not that terribly complicated, anyone who is comfortable with a few tools can do it. Swearing helps. Not smacking yourself on the head by leaning in too close or fast to the edge of the slide out will also help. The first step is to get yourself some kind of a recreational vehicle. I recommend the Open Range 386-FLR, with one of the couches removed. The space is perfect for a nice big desktop area. But all you really need is a piece of kitchen counter from Home Depot or Lowe’s, or some other such store, and something to use as pedestals, for it to sit on. I like filing cabinets as desk bases, because you can put stuff in them. Be aware that desktop height is 30″, and you will find that the vast majority of filing cabinets are 30″, which makes sense. But our desk was going into a slideout, and the “floor” of the slideout is 7″ taller than the floor of the RV, so I needed to find something shorter. I totally lucked out, and found the perfect lightweight but incredibly strong stackable storage drawers at staples. 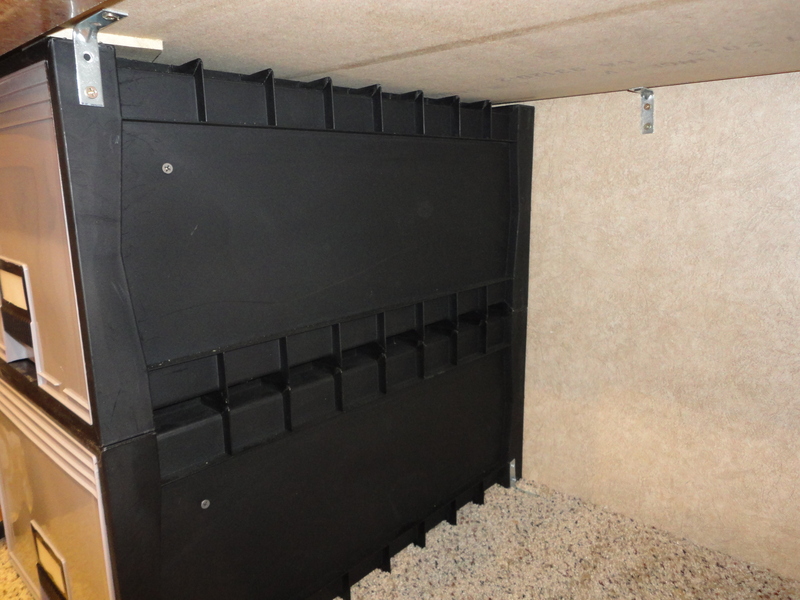 They are 24″ deep, which is a LOT of room, and they are designed to lock together when stacked, making them very stable. They’re designed to be full of paper, and stacked up to 10 high, so they will take a tremendous amount of compression force. And when two of them were stacked, they EXACTLY hit the height I needed. Your situation may not have the height restriction, so plan accordingly. In my rig (as you can see I the pics, there are two pieces of wood at each side of the slideout floor to reinforce the floor, so I placed the drawers just inside of those, which gives me a nice little cubby on either side of the drawers to stick things like power strips and laptop bags, and small pieces of candy I can forage for later. I used 2″ L brackets to anchor the drawers to the wooden floor with particle board screws, because they have nice fat threads. To anchor the drawers to the brackets, I drilled a hole in the drawers and used small bolts with fender washers so they don’t chew through the plastic while driving, and lock nuts. I also used brackets to anchor the desktop to the drawers, and to the wall of the rig. Obviously, you have to make sure that you use short enough screws so that you don’t damage anything hidden underneath/behind the structure. Each RV is a little different, but if you poke around you can find places to anchor things to. I also cut the desktop to its a very snug fit side to side, and that helps to stabilize it. And finally, because I ran out of time and as a temporary way to keep the drawers closed while driving, I just popped a drywall screw through the side of each drawer to “lock” the drawers in place while driving. I’ll come up with something sexier later. I am having custom fronts made that match the rest of the rig and found drawer pulls that also match, so the drawer fronts will match the rest of the interior. The decorative junk on the desktop is held on place using museum putty, which is amazing stuff. I highly recommend it. If you’re having an issue..stop and talk about it. MUCH harder to discuss things when driving and you may put yourself in a worse situation!! When you have filled the diesel exhaust fluid in a Ford truck you may need to let it sit for a minute then turn the truck on and off a couple of time to clear the warning message. If you don’t put the diesel exhaust fluid in the truck will limit your MPH to 50!!! Don’t let this happen. Not all Diesel Travel stations have truck or RV lanes you need to do more research to find out! River Plantation is right outside of Pigeon Forge, Tennessee (Home of Dollywood) and is specifically designed for large RV’s and Motor homes. Although I would not stay in one of the internal sites, the river view sites around the exterior were excellent. They are large and my site (#401) has a small waterfall behind it that was both picturesque and made great white noise at night. 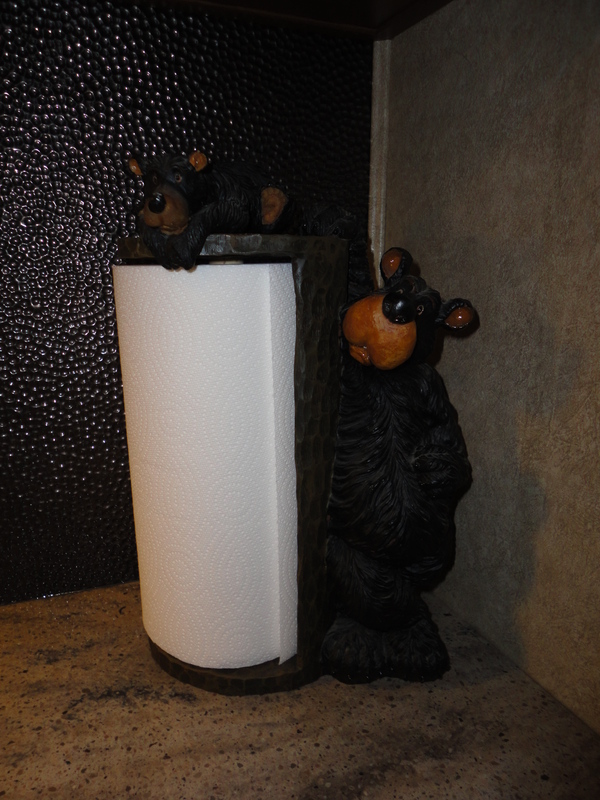 It was extremely neat, clean and safe with terrific laundry facilities and a very nice bath and shower area. The site also has several cabins, and although the smaller ones I would pass because they have no amenities, the larger ones have a small kitchen in them. The conference center is great if you’re having a rally and the people who run the place take it seriously. There are tons of family activities close by and the Smoky Mountains are very close. Despite being so close to so many attractions the place is tucked away and if you don’t leave the campsite it feels like you are in a more rural area. Overall I was thrilled and would definitely go back. My only complaint was the wireless was pretty spotty and at that price point I thought it could have been better. 4 miles off the interstate but extremely secluded. It is a smaller KOA but has a nice play area for the kids and a swimming pool. The camp store was very nice for its size and the people were super friendly. Wifi unfortunately was practically nonexistent unless you were near the lodge and then even a weak signal. It was also pricey for what you got…we paid $47 for a water and electric only pull through site. Another concern was a strong smell of poop throughout the campground. There were several cow barns nearby and I am guessing the farmer was manuring his fields. That being said it was friendly and a little off the beaten track which we like but I wouldn’t recommend staying here for more than a few days. This entry was posted in Uncategorized and tagged DEF, Diesel Exhaust Fluid warning, Ford F350 Diesel Exhaust Fluid, KOA Harrison, newbie campers, Riverside Plantation, RV navigating, RV Weighing, RV-Dreams Weighing. Bookmark the permalink. We have been to two of Howard and Linda’s Rallys, had a great time, met a many new friends and learned a lot of new info at both. We have been Fulltime for 2 1/2 years now and have enjoyed every minute of it, currently completing a trip from Florida to California. I was reading your DEF scare, I always carry a spare jug of DEF with us just in case we get a low DEF warning and cannot find more to add to the tank. You have to remember to rotate the DEF as it does have an expiration date. When I say “Rotate our DEF”, what I mean is I always carry a spare jug of DEF with us, When our DEF low light comes on I have 1000 miles to go so sometimes I stop a purchase a new jug of DEF before adding / refilling the tank., I always make sure I use the old jug and put the new jug in the storage bin. Ford did a much better job with the location of the DEF fill tube, I believe it is next to the fuel fill on the side of the truck. GM did not do so good, ours is under the hood by the Automatic Transmission fill tube so we are not able to use the DEF fill at most truck stops. We had our 5th Wheel weighted at the first RV Dreams Rally we went to in Kerrville TX, our 5th Wheel weights were ok but we did not have enough truck (we had a 2007 Chevy 2500HD Duramax) . We knew our truck was pushing the limit but did not know how much overweight we actually were. . 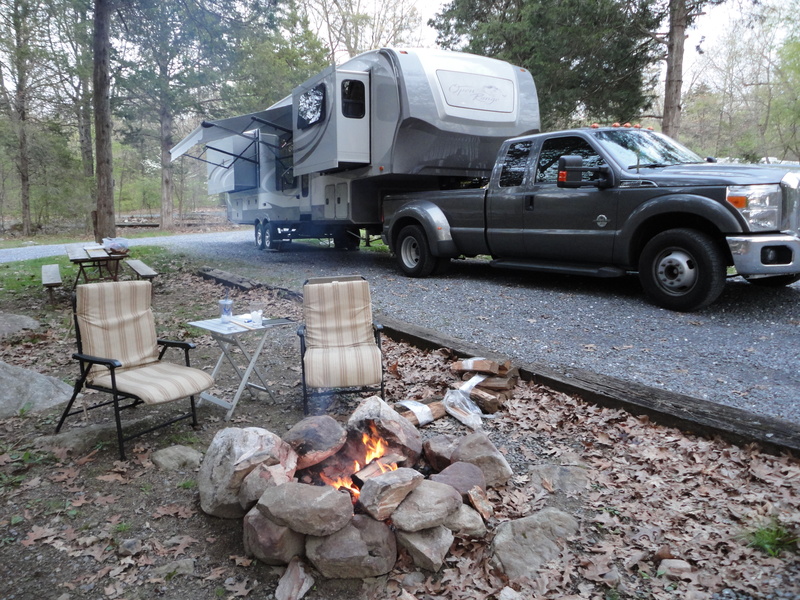 When we went to our second RV Dreams Rally in Franklin NC we had our setup weighted again with our new 2012 GMC 3500 HD DRW truck and we had added a Washer Dryer and some other stuff to our 5er since our last weighing. We came out good on both the truck and 5er but it was a interesting how much weight we added. We also recently replaced our 10 year old 16K rated hitch (we used it with our previous smaller 5er) with a 24K rated hitch, Now it is a much more solid ride (we were getting some clunking due to wear and tear on the hitch) and we have a good safety margin. Thank you very, very much for the info about the desk. Mitch actually built one very similar in our s&b and we were kind of toying with building something like that. The only concern would be the weight of the file cabinets. Also, both of us need to sit next to each other at the desk, and I’m afraid the width of the cabinets doesn’t leave too much space for 2 under the desk. We may land up just buying a 6′ x 2′ table and maybe put a piece of laminate over it to make it look nicer. We shall see. Right now, I’m looking at photos of the couch and wondering if we’ll even be able to remove it! Oh how you guys crack me up! Yes, we’ll all get irritated with each other for some reason or another from time to time. I like Sue’s nap tip 😉 We are learning how fast the DEF seems to go while towing. We will keep extra with us too as some of the gas stations and WalMart either run out or it is expensive. Our DEF is right next to the gas hole in our Dodge and it will fit the big station hose too. Nice. Even nicer, today when Steve bought more DEF, he was bummed that it did not come with a built in funnel. At that same time I was cleaning out the back seat of the truck and noticed something white under my seat. Turns out it’s a funnel for the DEF. How thoughtful of Dodge to putl one in the truck! We’ve been making up time and are driving through TX, I40, today and should pull in to Surprise AZ just before dark. Whew. We don’t want to have to do these kinds of miles again. We have an apt for the next rally to get weighed. Good for you guys for being perfect weight. Thanks for the pig-poop campground laugh! Thanks!!!! So glad this are going great for you! !